Delaney has been really interested in writing lately — especially her name, but other letters and numbers as well. Her little scribbles and letter shapes have been on grocery lists, maps, Christmas wish lists, and sweet letters and cards. Since she is so interested in writing right now, I have been trying to offer her lots of extra fine-motor activities to help build strength and coordination in her fingers and hands. Of course to her, it’s just playing – which is just how I like it! There’s been lots of focused cutting. I give her 1″ strips of construction paper, and she cuts, cuts, cuts them into tiny pieces. We save these pieces for making collages later. She really enjoyed working with this clothespin counting game at preschool. The clothespins had the numbers 1-10 written on them and she had to count the animals and clip on the correct clothespin. Today, I set-up a chicken and egg transfer activity for her. I have seen so many neat transfer activities on various Montessori blogs and websites. We used a chicken chop stick, an egg tray, and 3 types of materials for eggs: cotton balls, packing peanuts, and small white pom poms. The idea was to put one item in each section of the egg tray. Delaney loved this and did it multiple times. This would be really fun to do with a unit on farm animals. We’ve been working with our homemade play dough a lot, too – trying to roll balls and snakes, making flat pancakes and cookies, and sticking in candles for birthday cakes. Mr. Potato Head is great for working fingers too — we made Mrs. Pumpkin Heads last night! Happy playing and Happy Halloween! Such great ideas! You Potato Pumpkin heads are my favorite pumpkins of the whole season – so cute!! Thanks for posting this! I have a just-five who could definitely use some practice with his small motor skills. I love your fine motor work. When she is using the zoo sticks, you might try having her hold a small object in her last two fingers. This facilitates separation of the two sides of the hand and promotes a more mature pencil grasp. LOVE the potato head pumpkins, brilliant! We use all kinds of tongs to put colored pom-poms into nesting cups (the colorful ones that babies play with) and play ice cream shop. I give my son all kinds of creative orders like “extra-large purple passion, vanilla, and orange sunset sundae with a cherry on top. 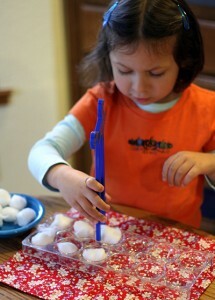 Good for fine motor skills, memory, and less calories that the real deal! You have such ideas here. I will definetly be subscribing to this great blog. I know this isn’t what your post is about, but I absolutely love those Mr & Mrs Pumpkin-heads! SOOOOO adorable and easy for the kids to make! I included them in a roundup of pumpkin activities for kids today :) Thanks for the inspiration!